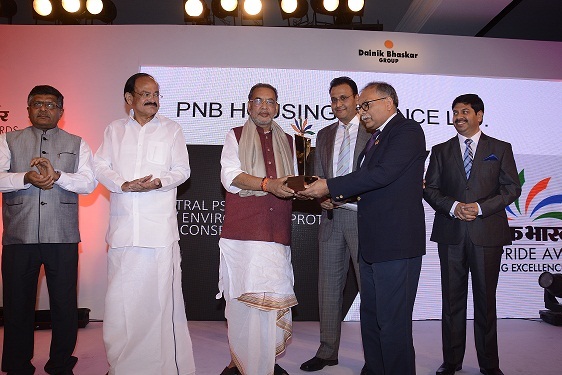 New Delhi, 05th April, 2016: PNB Housing Finance Limited, the country’s 5th largest housing finance company has been bestowed with the award for Excellence in CSR at the prestigious India Pride Awards 2016 ceremony held at New Delhi. The award was received by Mr. Sanjaya Gupta, Managing Director, PNB Housing Finance Ltd from Hon'ble Union Minister of Agriculture Shri Radha Mohan Singh for the company’s contribution towards their best practices in CSR in the august presence of Shri Venkaiah Naidu, Union Minister of Urban Development; Housing and Urban Poverty Alleviation and Shri Ravi Shankar Prasad, Union Minister of Communications and Information Technology. Speaking on the occasion, Mr. Sanjaya Gupta, Managing Director, PNB Housing Financial Ltd said, “It is a moment of pride for us and this award is a testimonial of the dedication and passion to help those who create our homes. PNB Housing has been constantly building inroads for upgrading the skills of construction workers and creating a conducive environment for their children. These are some of our efforts to contribute to the society at large and work towards nation building. These recognitions further strengthen our commitment to continuously engage with these communities towards supporting their development”. PNB Housing Finance Limited has collaborated with various NGOs to offer day care services to the children of construction workers on various construction sites and provide these children with education, hygiene and nutrition. PNB Housing has till now established various day care centres in Delhi NCR at construction sites and urban slum areas. The company, through its CSR interventions, has collaborated with various training institutions to provide quality training to construction workers that will help them progress in their field and earn better remuneration. The India Pride Awards seek to honor PSUs which play a vital role in the development of the nation and serve as pillars of strength for the Indian economy. The Awards are significant because the selection process of an esteemed panel of judges is also supported by judicious and objective recommendations from ICRA.